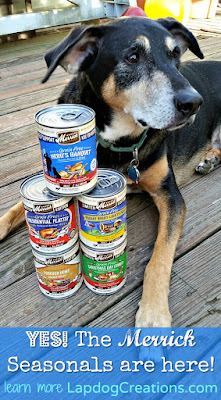 Disclosure: Merrick sent 5 cases of canned food to Lapdog Creations, free of charge, for review purposes. We only share information that we feel is relevant to our readers, and all opinions expressed are our own. This post may contain Amazon affiliate links. If you click on one and make a purchase, I may receive a few pennies to assist in maintaining this blog. 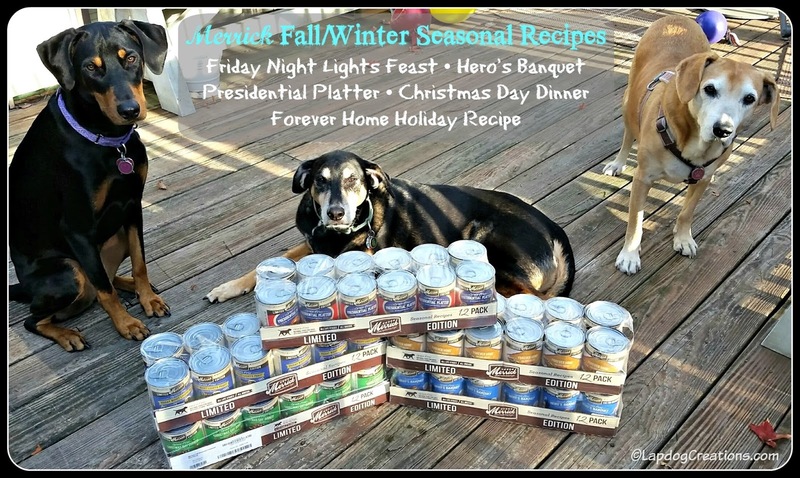 With the release of their annual fall/winter recipes, Merrick takes your dog's dinner bowl from the start of fall football season to the crazy election and right on through to the holidays... leaving only empty bowls behind. The Lapdogs love the seasonal recipes so much that not only do they lick their own bowls clean, they then perform final inspections on each other's bowls, ensuring that not one teeny-tiny morsel is left behind. This year's offerings did not disappoint one bit. With three returning favorites and two brand new tasty recipes, there is something to please every Best Dog Ever. Featuring turkey, chicken, sweet potatoes, carrots and pears, this recipe really gives back! For every can sold, Merrick will make a donation to K9s For Warriors to support their mission of pairing specially trained rescue dogs with veterans suffering from post-traumatic stress disability (PTSD). Made with beef, chicken, Yukon gold potatoes, red delicious apples & peas, this recipe also gives back! 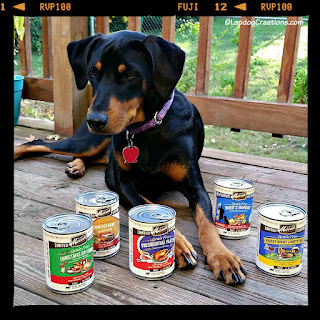 Sales of this tasty recipe benefit homeless dogs. 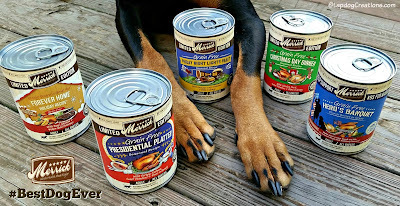 For every can purchased during the holiday season, a meal will be donated to a shelter. Friday Night Lights Feast - brand new recipe! This feast features beef and beef liver in a delicious beef broth with dried potatoes, dried peas, apples and spinach. Your dog will be looking forward to game day every week! Christmas Day Dinner - back by "pup-ular" demand! 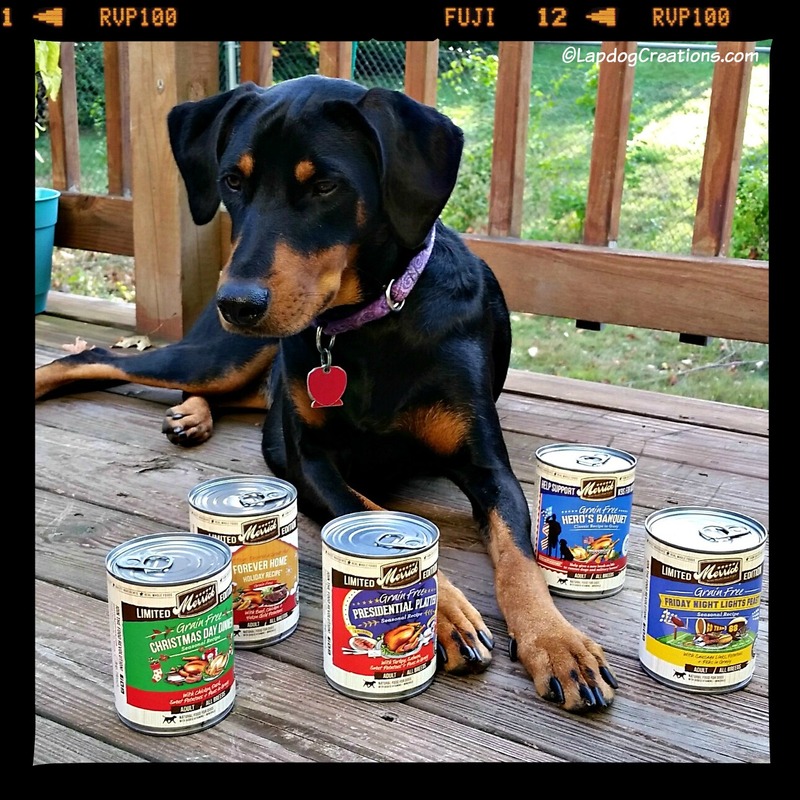 Truly the perfect way for any dog to celebrate the holiday, this recipe features a mouthwatering blend of chicken and duck in a chicken flavored broth with dried potatoes, sweet potatoes, dried peas, and dried cranberries. Your dog will be caroling for his supper! Presidential Platter - brand new recipe! This past spring, Merrick held an election on Facebook and this recipe is the result of the highly contested "can-paign!" After all of the votes were counted, Presidential Platter beat out Election Day Buffet to become the next fall seasonal recipe. The recipe features turkey, salmon, carrots, and green beans in gravy... and the Lapdogs give it their uncontested vote! All of the grain-free recipes are crafted one batch at a time for holistic, balanced nutrition. Plus, all of Merrick's food is Made in the USA with regionally sourced ingredients, including high-quality meat, poultry, fruits and vegetables. Is your #BestDogEver ready to indulge in some seriously satisfying comfort food? Pick some up or order online ... but hurry, these recipes won't be around forever! While you're stocking your own cupboard, grab a few extra cans. 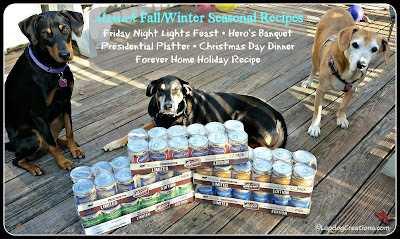 Merrick seasonal recipes make excellent stocking stuffers for every man's best friend, including those awaiting their forever homes at your local shelters! I love Merrick's seasonal recipes! They're so unique and festive, and of course tasty. That reminds me I need to pick up a can of Presidential Platter before the big night! Merrick is always a hit in our house. We tried the Thanksgiving Dinner this month and it was super.